Yes, you’ve read that right. You can actually vacuum seal mason jars. The reason you need to vacuum seal bags filled with food holds true with mason jars as well. You need to pump the air out of the container to prevent early spoilage. Not all vacuum sealers can be used for sealing mason jars, though. There are those specifically designed to include mason jars into their capabilities. These vacuum sealers come with few attachments that would let you seal mason jars and cans. With this said, let’s check out some of the vacuum sealers that are worth the money. The fully automatic FoodSaver V4840 vacuum sealer is one of the most innovative machines out there because of its 2-in-1 capability. You can store dry or liquid foods, and do this using vac bags or containers. It also boasts a retractable handheld sealer for added versatility when sealing, especially with containers like mason jars. All you have to do is to pull the retractable vacuum nozzle out of the unit, remove its clear piece and insert the black vacuum nozzle into the valve on the lid, then press the “accessory” button. This vacuum sealer has the hose port for your mason jar attachment (that can be bought separately). Added feature is an attachment for sealing zip-top bags that have vacuum valved holes. Save your food in a jar with the Nesco VS-02 Food Vacuum Sealer. It has a vacuum port for a hose attachment needed for sealing jars. In fact, customers rave about how excellent this machine is when it comes to sucking out the air from a jar, as evident by the longer shell life of stored foods. THe only downside is that it doesn’t come with a hose attachment. This isn’t a problem, though, if you have one from an old vacuum sealer sitting at home. Even if none, hose attachments can be bought separately at very affordable price. The advantage of a handheld vacuum sealer is that it doesn’t take too much space in your kitchen. You can just hide it inside the cabinet when not in use. Moreover, it is very portable, which is a handy feature when you are travelling a lot and you can’t do away with keeping your food fresh while on the road. It also tends to be much cheaper than the regular-sized vacuum sealers out there. One of the best recommended handheld vacuum sealers is the Waring Pro PVS1000 Professional Vacuum Sealer System. This unit has a a single suction cup found on the far end of the pistol. 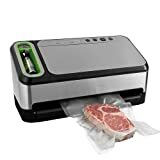 All you need to do is place the jar sealer’s hole (any jar sealer works great with this vacuum sealer), press the trigger for about 10 seconds, and the jar is sealed up tight as a drum.